Have you checked lately to make sure that your dog is up to date on all of its shots? By law, all dogs need to have an up to date rabies shot. The first rabies shot lasts for a year and all rabies shots after that last for three years. It’s a good idea to also get your dog the DHLPP shot which includes Distemper, Hepatitis, Leptospirosis, Parvo, and Parainfluenza. Some vets do a different version but the Distemper is always included. Finally, if you’re planning to do daycare, boarding, or even want to take your dog to the dog park, you should make sure he/she has a Bordatella shot. This will help protect against kennel cough. It’s still possible for the dog to get kennel cough, but he/she will recover quicker. So check those vaccinations to make sure your canine pal is safe! Did you know that 26,000 dogs are injured or killed every year due to collar related injuries? Many get their teeth caught on another dog’s collar when playing while others jump on a fence and their collar gets caught and they hang themselves. There are numerous ways that a dog can get caught, but there is something you can do aout it. For the times when your dog is playing or not being supervised you may want to use a breakaway collar. If the collar gets caught on something it will easily come undone so the dog doesn’t get injured or worse. If you use a breakaway collar, please remember not to walk your dog with the leash attached to it because if there’s one good tug then your dog is loose. Also, be aware that if the dog’s identification tags are on the collar and it breaks away they could be lost, leaving the dog without identification. You problably want to make sure that the dog is microchipped just in case. I believe that there are pros and cons to the breakaway collar and it may not be good for some dogs, but for others it might be best. Well, this month it’s Pets of the Month because we had to share this awesome picture. This is Nick, Libby, Pritzie, and Armi. They are sisters, brothers and cousins (Can you figure that one out?). 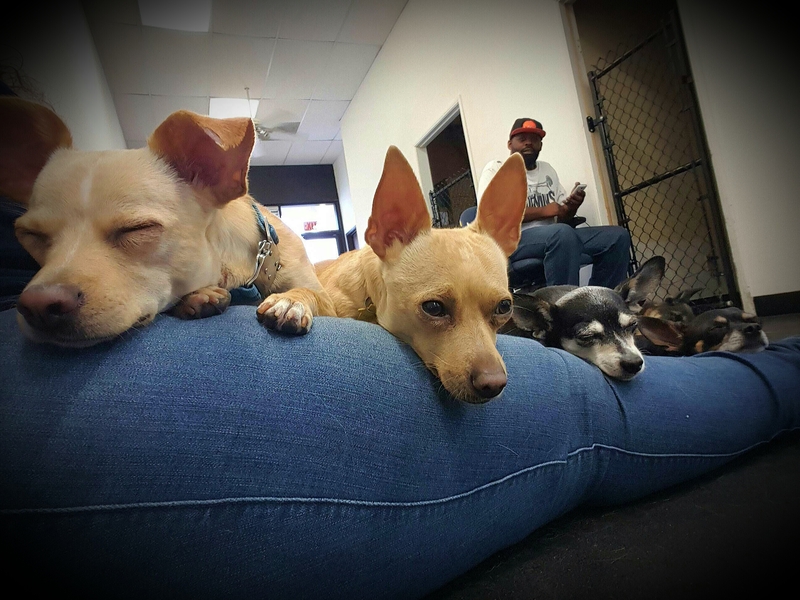 This fab four comes to us for daycare, boarding, grooming, and Nick has done some training. As you can see by the picture, they love people and they’re great with the other dogs too. Their good friends include Penny (a Cockapoo) and Oliver (a Goldendoodle). Do you know if your dog is getting enough exercise? Here are some clues to help you figure it out. Does your dog bark excessively, often over nothing? Does he/she dig, destroy, and chew everything he/she can get a hold of? Does he/she pace from room to room? Does your dog whine excessively for no obvious reason? Does he/she constantly jump when people are around? Does he/she run along your fence and bark at anyone and anything that goes by? Does he/she rarely lie down, even when everyone else is relaxing? Does your dog run away whenever he/she gets the chance? If you answered yes to any of these questions, there’s a good chance that your dog does not get enough exercise. A tired dog is a good dog, so take Fido for a long walk or hike. Go to Dog Beach for a swim. Get your dog on a treadmill for a good trot. Throw a ball or a frisbee around for Fido to fetch or catch. There are lots of ways to wear your dog out. For more suggestions, feel free to give us a call at 760-739-7299. 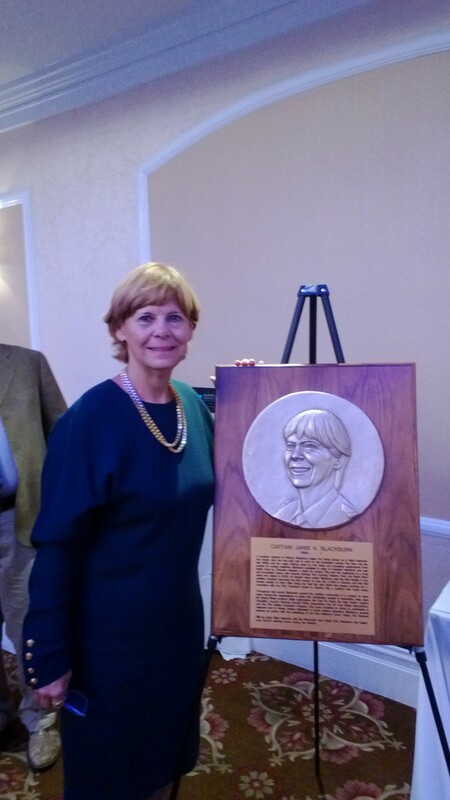 In September, my mother Janis Blackburn was inducted into the New Jersey Aviation Hall of Fame. She is a retired airline pilot and the first woman in the world to fly the A300, the first woman to ever become Captain at Kiwi Airlines, and the first woman ever to retire from Spirit Airlines. She was inducted with Henry M. Holden, an aviation author and Brigadere General James E. Young, a retired World War II combat pilot. Previous inductees include Charles Lindbergh and Amelia Earhart. What does this have to do with Sandy Pawz Dog House and dogs? Well, she has a dog named Oreo, but honestly, absolutely nothing. I’m just proud and wanted to share. Don’t forget, around the holidays our grooming appointments fill up early and boarding space at Sandy Pawz Dog House is limited and we’re already taking reservations for both. To ensure we can get you in, give us a call at 760-739-7299 to set up your grooming appointment or to reserve your boarding spot!